I stared dumbfounded, unable to bring myself to accept the events that just unfolded on my screen. My wife, who was next to me at the time started to worry as a guttural growl issued from my lips. Within twenty minutes I had lost two of my main party members. Not by combat, simply by the choices I made and how they played out. 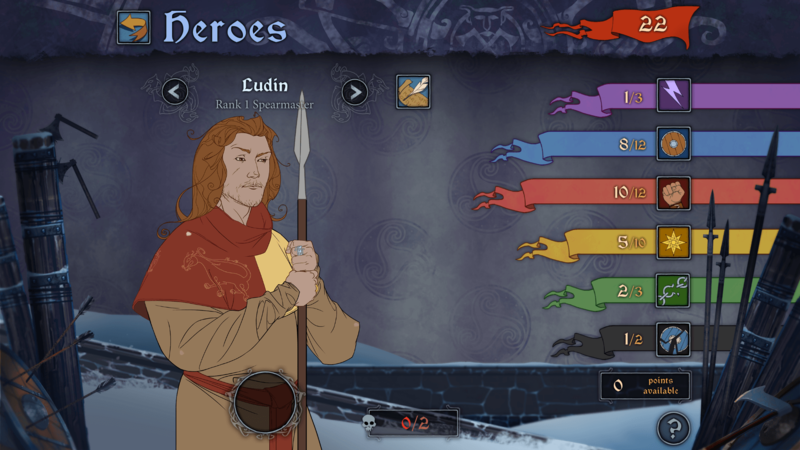 In The Banner Saga, your choices matter, and they completely alter the story as a result. I’ll fully admit, I have been a fan of Stoic’s Viking saga since I reviewed the PC release back in January. The story, coupled with the great tactical combat really hit home for me. The lack of a real save system also makes you feel the weight of your choices, as there is no way to simply reload a save and do have a “do-over.” The Banner Saga makes you live with your choices, as well as cherish them when they turn out well. In The Banner Saga, you take the role of multiple different people as you flee the stone-like Dredge. The humans and the Varl, giant-like creatures with impressive, yet imposing horns, have maintained a shaky alliance since the Second Great War, but something feels different with this invasion. The Gods are dead. This is the first thing you read in the game, and it really helps set the mood. To top it all off, the Sun has mysteriously stopped moving, covering day and night in an eternal light. You’ll constantly switch viewpoints throughout the game, sometimes controlling the human, Rook, who is trying to guide a caravan from the destroyed village of Skogr with its meager amount of survivors. Other times you’ll be set in the role of Hakon, a Varl known for his great deeds against the Dredge in the Second Great War, but is reluctantly leading a caravan from Strand with Prince Ludin from Arberrang to the Varl capitol of Grofheim. 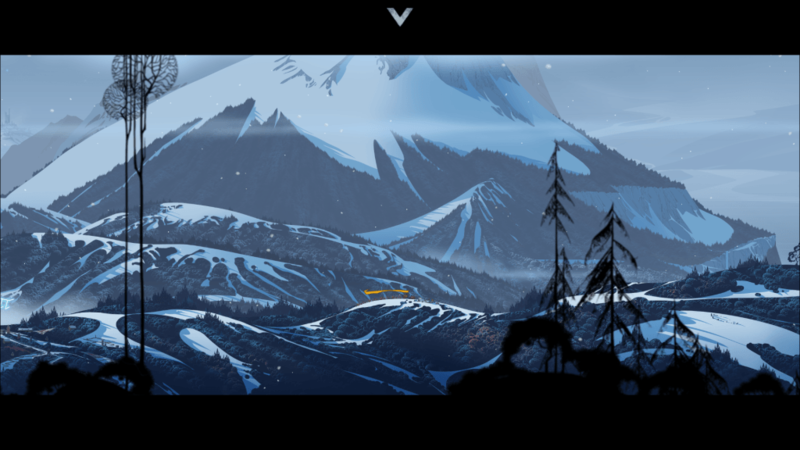 You’ll travel snow covered lands, each environment beautifully drawn and fully realized on your device’s screen. The artwork is inspired by the work of Eyvind Earle, the artist notable for the background, art and style of Disney’s Sleeping Beauty (so much so they named a character after him!). The beautiful landscapes are presented well on Android, as evidenced by this screengrab from my Galaxy S4. As far as how the game handles on Android, I have to say I’m quite impressed. Reading the initial user reviews on the Google Play Marketplace, I was skeptical at first. Reports of lag and constant crashing seemed to plague users, but in the end my experience has been much different. I’ve been playing the game on my Samsung Galaxy S4, and while it’s not perfect, it handles well enough to not hinder the experience. One issue I have noticed, which to some might be bothersome, is for some reason the audio tends to chug when the device is connected to a Bluetooth source, which is a shame since Austin Wintory’s masterful soundtrack really helps set the mood of the game from the outset. I played a bit in my car while waiting for my wife to get out of the store and connected my phone to my car stereo. The audio was so badly lagging that I disconnected it, only to have it continue afterwards. A full restart of the game fixes this, until you reconnect. I also connected it to a set of headphones to see if it was an isolated occurrence, but still the problem persisted. Loading times are also an issue, and while I understand that this is a PC port to a less-powerful device, everything requires a loading screen. Sometimes these screens take five to ten seconds to load, othertimes it’s closer to forty seconds to a full minute, especially if you want to view your map. There is also a slight lag when events pop up on your screen for your to interact with, but nothing that can’t be overcome. Controlling the game is pretty straight forward. For PC you could play the whole game using just the mouse, so this translates well to a touch screen. I never once felt my smaller screen was a hindrance, either, and as a result have had no issues with clicking the wrong thing on accident. That was a real fear of mine, as accidentally making my Varl move to a different part of the battlefield, or having someone use an Area-of-Effect skill when I have party members in the way could mean the difference between victory or defeat. The unforgiving combat in The Banner Saga was one of my favorite things in the PC release, so seeing it fully realized on Android is great. Tactical combat is something that if not done correctly can be a struggle. 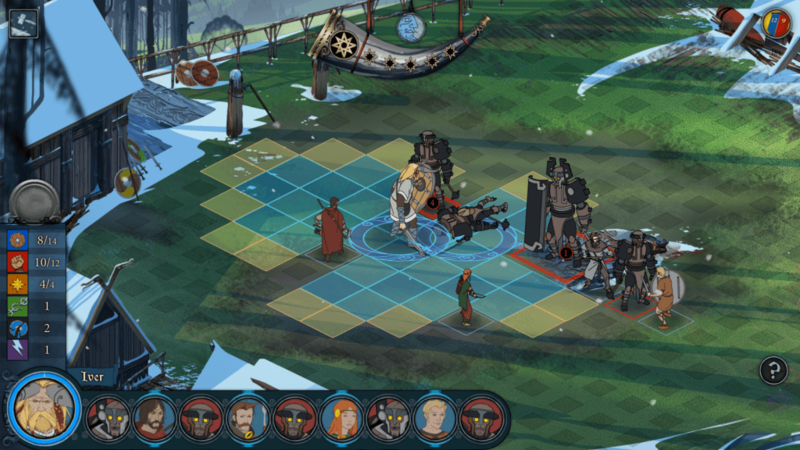 The combat in The Banner Saga is oftentimes hard, but not because the game is hindering you. Positioning is important, as well as managing your strength, armor and willpower on the battlefield. Fighting your dredge enemies isn’t always simply about battering them to death either. Each character has two important stats for staying alive: Armor and Strength. Armor is just that: armor. The higher the stat, the less damage an enemy can do to you outright. Strength is important for two reasons. First, it measures your character’s health. If your strength runs out, you die. Also, the higher your strength, the more damage you do to an enemy. Keeping your strength high is important for that reason as well. If your strongest Varl has become a pin cushion for enemy slingers and had his strength whittled down, his attacks will not be as potent. Combat is unforgiving. With no “undo” you live, and die, with ever decision you make. Some enemies will also deflect attacks at a high rate if their armor isn’t chipped away first, most specifically the Dredge Warriors. As I stated before as well, positioning is important, especially in keeping some of your party members alive. Keeping your Varl and other melee humans upfront to protect your archers and mender is a must. Also, you can do friendly damage, so making sure your party members are not in range of an AOE is equally important. It’s also nice to be able to zoom in and out in the battlefield to get a better view, but it is here that sometimes my small screen can be a disadvantage, as zooming in can sometimes make the battle feel cluttered. Also, during combat you will experience some lag, but it only happens during turn changes. It feels as though the game is trying to switch characters and move the camera while also starting the turn too soon. Once you get used to it, it’s not that big of a deal however. For a PC game to run this well on a phone, some lag is to be expected. I can’t say whether this happens on more powerful Android tablets, but I can assume it’s likely better on those devices, especially newer ones. Even though the Gods are dead, their stones still stand. Out of combat you will follow your caravan throughout the landscape in an Oregon Trail style presentation. Your caravan moves across the screen while at the top you measure your supplies, morale and days traveled. The longer you travel without rest, the lower your morale will go. Keeping your morale up is key to making battles easier, but you have to balance that with supplies. The more you rest, the less you have supplies for the road. A key stat to keep track of is Renown. This works as a currency in multiple ways. You’ll use renown to buy supplies from merchants, upgrade characters as well as buy items. You gain renown from actions and choices outside of combat, but also buy killing enemies in combat. Once the renown is spent, you can’t gain it back as there is no buyback feature. The lack of a true save system comes into play here as again, you cannot go back and “undo” your past mistake. You live with it and move on. You’ll use renown to upgrade your character. Each stat is important, so choose wisely when upgrading! I think it’s fair to say that the game feels as though it was meant to be on mobile all along. Simple, intuitive controls really make it easy to drop in and play, and while my phone isn’t the largest thing on the market, it handles well enough to make it worth grabbing. While it may not be the ideal “pick-up-and-play” title like the majority of mobile games out there, it doesn’t need to be. 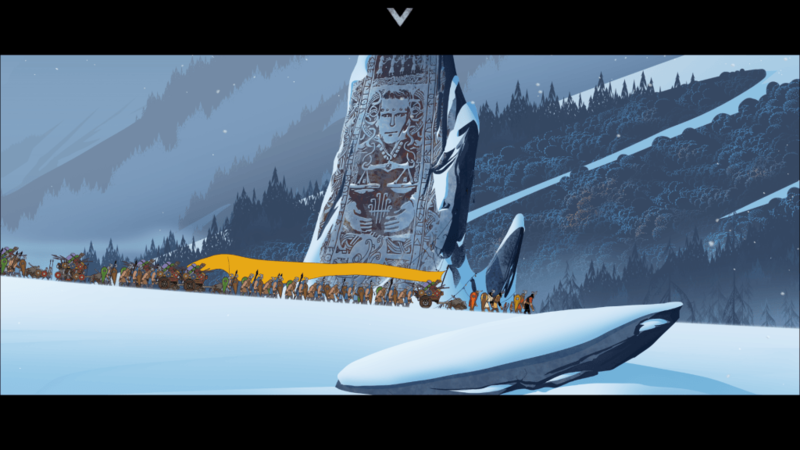 The Banner Saga begs your attention, and it wholeheartedly deserves every bit you have to give. All-in-all, The Banner Saga is an excellent game with an engaging story, wonderfully unforgiving combat and beautifully presented visuals. You’ll find yourself engrossed in the plight of your party members, each one weaving their own story in the great banner of the world. Your choices, and your ability to live with them define the story, making each playthrough different, yet more engaging than the last. As far as the game as a port, it handles well on my device, though not without its issues. Slight lag during combat and when events pop up are minor annoyances, and overall the game controls well. If you can get past the long and frequent loading screens you’ll be fine. Just don’t connect your device to a Bluetooth source until the game is patched to fix this. Remember: the Gods are dead, so you’re on your own against the endless hordes of Dredge. How you handle them is your decision, and one you’ll have to make over and over again. What will your banner tell? The Banner Saga for Android is an excellent port of the PC game. Beautifully realized visuals, engaging story and unforgiving combat outshine the negatives with this port. If you can get past slight lag and long loading screens you'll find the price tag just right.